Underwater Kinetics makes everything from flashlights to dry boxes to knives. They also do fire products, utility products, industrial products, and camping gear. Their knives are uniquely suited for diving as they are made from corrosion resistant materials such as titanium and hydralloy. 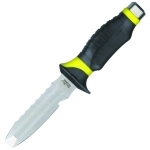 These knives are designed for high salt environments and are extremely hard use. Underwater Kinetics produces blades in various sizes and with various sheathing options so you are sure to find the right one. Below is a chart showing the best Underwater Kinetics knives on the site as reviewed by multiple users. Keep in mind that there are many great Underwater Kinetics knives out there, but if you can't decide on one after searching the site, choose one off this list and we are confident that you will be happy!